From diagnosis to managing blood sugar levels, managing symptoms to preventing new ones, diabetes can be a relentless occupation ‒ both for patients and healthcare professionals.1 As digital technology continues to advance, we are moving towards a wide range of exciting new innovations within the diabetes space, which have the potential to change the way we manage this disease. 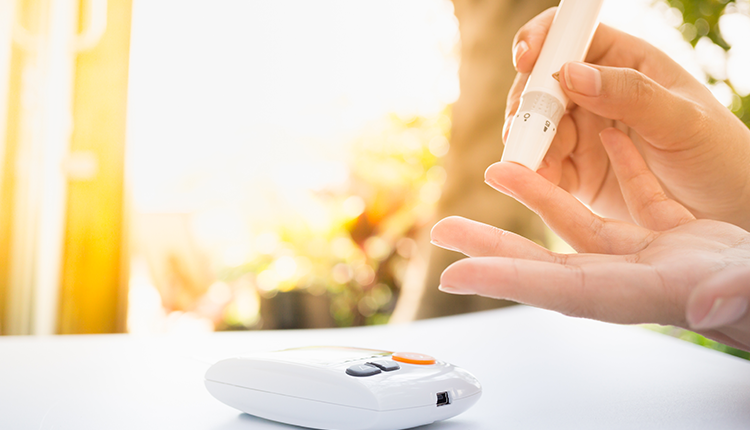 With new technologies on the horizon, which will enable us to identify at-risk patients in seconds, and better manage the insulin levels of those already diagnosed, the future of diabetes looks bright. At Create, we are inspired by the ever-evolving world of health, and the freedom and dignity this grants patients, and the very real impact that slicker diagnosis may have on their long-term outcomes. Here are some of our favourite innovations to date, as well as some pipeline projects which have the potential to reshape the way we consider diabetic health. Until recently, a finger-prick test twice a day, every day, has been a necessary evil for many diabetic patients.2 Historically, this uncomfortable, inconvenient draw of blood has been the only method to secure an accurate blood sugar reading, essential to managing any unwanted fluctuations. Luckily, times are changing with innovations such as Epic,3 the clever blood glucose monitoring app, which takes quick and reliable readings without any prick of the skin. Using the smartphone features already widely available to patients, users simply place their finger over the phone’s camera, and let the app do the rest. Readings are instantly available, and with other handy features, such as a diet log and personalised advice and alerts, it’ easy to see the appeal to end users. CGM works through a sensor, which sits just under the skin and takes glucose readings from the interstitial every few minutes. Over time, a profile is built up of the peaks and troughs in a patient’s blood sugar, and can be analysed against diet and other risk factors, so that these can be managed better in the future. In particular these devices are incredibly useful for warning against hypo- and hyperglycemia, and results can be shared easily with doctors and nurses, so patients feel empowered to better manage their health. As innovations such as CGM become ever more commonplace, a whole world of possibilities in diabetes management opens up. Perhaps one of the most exciting, is the development of the automated insulin pump, which delivers insulin to patients throughout the day.5 When coupled with CGM, insulin pumps can use this real-time data to make more informed decisions about when they deliver the next dose. For example, if data from CGM indicates a patient’s blood sugar is too low, the insulin dosing simply stops until levels rebalance. Although still in the pipeline, this device shows great potential. Each contact lens would be fitted with a tiny, ultra slim microchip, which would transmit collected data to a paired smartphone. Data would be available in real time, for a reliable, non-invasive measure, whenever needed. Importantly, this type of technology has the potential to lower the costs of managing diabetes, and enables patients from any walk of life to manage their health more effectively. This one is definitely still in the pipeline, but what if we could tell what someone’s blood glucose level was, just from looking at their skin? In the future, this may be true. Researchers at Massachusetts Institute of Technology and Harvard University are in the process of developing biosensing tattoos, created out of a specialised ink known as DermalAbyss.7 In theory, the tattoo will change colour, based on a person’s blood sugar levels, pH and sodium. For example, if their blood sugar started to rise, the ink would turn from blue to brown. Whether these tattoos will ever be used clinically or commercially remains to be said, but we love the potential that products like these could have in how future generations manage their health. In the world of diabetes, symptoms such as diabetic retinopathy are a big concern. As the glucose-rich blood begins to damage the nerves in the back of the eye, some patients are vulnerable to permanent sight loss.9 Although patients typically get their eyes checked out once a year, miniscule changes in the eye are missed, and damage to the nerves is diagnosed too late. Over recent years, IBM have been working hard to show how deep learning and analytic tools can be used to analyse medical images pixel by pixel.10 According to preliminary results, this technology is able to spot patients with diabetic retinopathy with 86 percent accuracy in 20 seconds, under lining the exciting potential that machine learning may have on future health insights. Which innovations were you most inspired by? If you know of any innovations in diabetes, which you think are geared for the future, why not let us know on LinkedIn or Twitter? Everyday there are breakthroughs in science that are ultimately going to change people’s lives. There is so much untapped potential within Health just waiting to be explored, and that’s worth talking about. Being at Create allows me to satiate my inner science geek and push the creative potential of how we perceive science. There’s an expression, “our health is our wealth” ­­­– this should never be underestimated.